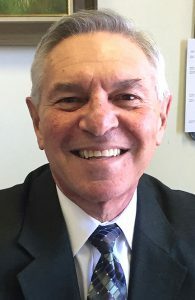 Michael Consuelo is retiring as Chamber executive director at the end of September. The Lake George Regional Chamber of Commerce announced the appointment of Gina Mintzer, CMP, as its new executive director, replacing Michael Consuelo, who is retiring. 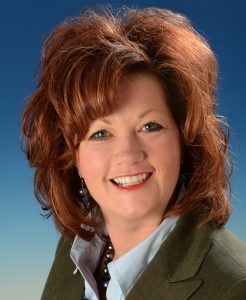 Mintzer has served as the director of sales for the Albany County Convention & Visitors Bureau (ACCVB) for 19 years. In this role, she assisted in the stabilization, expansion, and evolution of Albany as a visitor destination despite economic and national conditions throughout the last two decades. She managed a team of six convention sales and services professionals dedicated to quality client, colleague, and community customer service, officials said. She was the information resource for meeting and sports event planners working closely with the Times Union Center, Empire State Plaza Convention Center and all the Albany County hotels on client events ranging from the NCAA tournament to the Maccabi Games. Mintzer also assisted efforts to ensure strong business for the new Albany Capital Center. Glens Falls Hospital will receive $19.95 million in state funding to bring together outpatient medical services in one location, improving accessibility, communication and coordination. 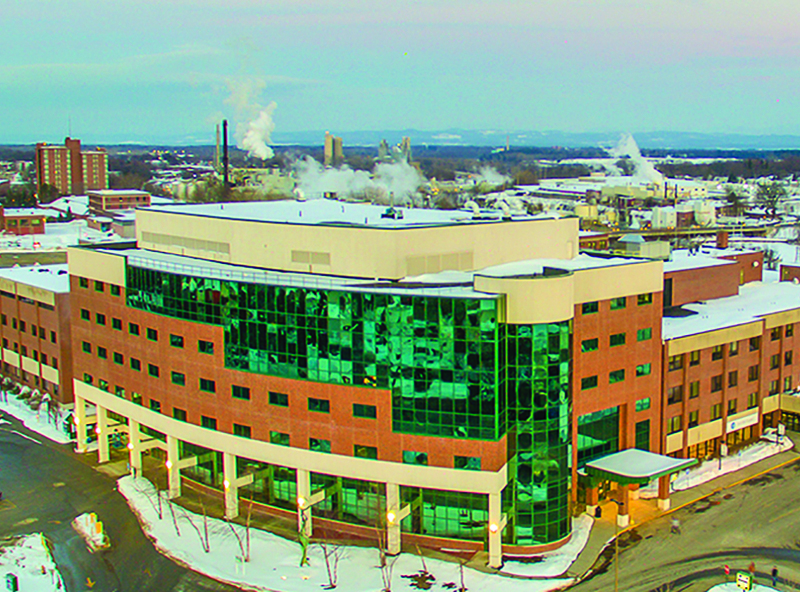 Glens Falls Hospital will receive $19.95 million in state funding through the Department of Health’s Statewide Health Care Facility Transformation Program to create an integrated, patient-centered Medical Village on the main hospital campus. The award, announced in July by Gov. Andrew Cuomo, is believed to be the largest public or private grant in the hospital’s history, officials said. It was also the largest Transformation Program grant awarded in the Capital and North Country regions, and the fourth largest in the state. The grant is part of $28.7 million given by the state to support five projects officials said will protect and transform the Capital Region’s health care system. 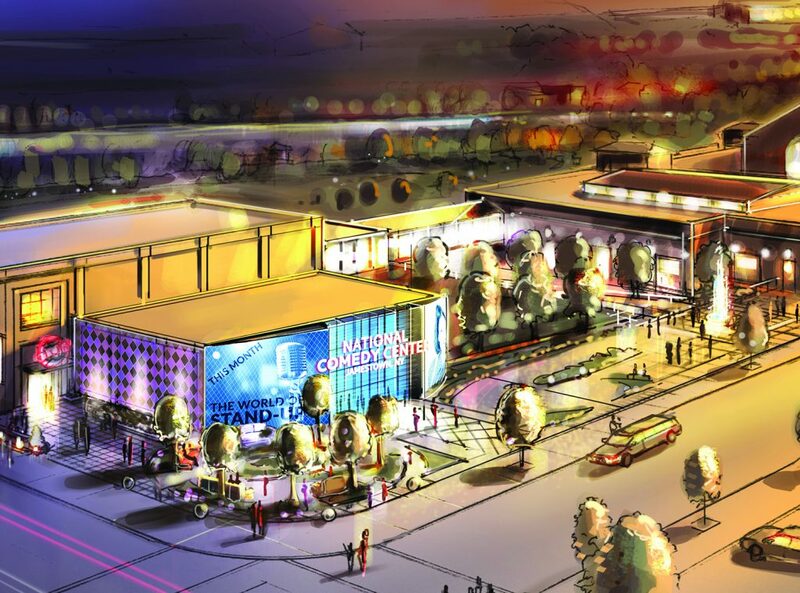 This is a rendering of the National Comedy Center that is being built in Jamestown in the southern tier of New York, assisted in design by Adirondack Studios in Argyle. The National Comedy Center (NCC) has awarded a $2.9 million contract to an Argyle company. Adirondack Studios will fabricate and install the scenic components of the center and its exhibits. The project involves renovation and restoration of the historic Jamestown Gateway train station. Jamestown is in the southern tier, in Chautauqua County. Adirondack Studios creates the scenic and themed environments experienced in venues that range from theme parks to casinos, museums, live shows, retail and public art. With this contract, the project continues to make progress toward its targeted summer 2018 opening, according to state officials. The center will celebrate the history of comedy, the craft and its artists. 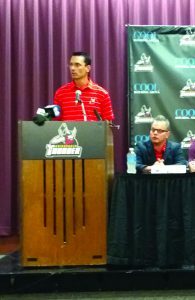 The Adirondack Thunder’s new coach Brad Tapper speaks at an Aug. 8 press conference. The Adirondack Thunder entered into a one-year affiliation agreement with the New Jersey Devils and Binghamton Devils to become the team’s new NHL and AHL affiliate for the 2017-18 season. The Thunder also named Brad Tapper as the team’s head coach. The announcements were made Aug. 8 at Cool Insuring Arena in Glens Falls. The Devils will be the Thunder’s second NHL affiliate, following the Calgary Flames, which owned and operated the team from 2015-2017. The Thunder had an “informal working agreement” with the New Jersey Devils and Albany Devils over the past two seasons, which saw several players play for both the Thunder and the Devils over that span, team officials said. Tapper becomes the second head coach in franchise history, following Cail MacLean, who left after accepting a position with the Stockton Heat of the AHL. Tapper, 39, has eight years of coaching experience at the AHL, ECHL and junior levels. He previously spent time as an assistant coach with the Rochester Americans, Chicago Wolves, Orlando Solar Bears and Florida Everblades, as well as head coach of the North York Rangers of the CCHL. The Scarborough, Ontario, native qualified for post season play in five of his seven seasons in the professional ranks and was a part of the Kelly Cup Championship Florida Everblades in 2012 as the team’s top assistant. 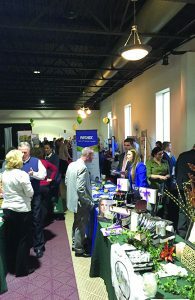 Attendees at last year’s Business Expo browse the various booths. The Adirondack Regional Chamber of Commerce (ARCC) will hold its annual Business Expo on Thursday, Sept. 21, at the Queensbury Hotel, 88 Ridge St., Glens Falls. “This has truly become the annual business expo of the Adirondack foothills region. The introductions, re-acquainting and catching up on what is happening now, in the many pockets of our region, are second to none,” said Tori Riley, ARCC president and CEO. Three hours include opportunities for dynamic networking, information gathering and making connections with more than 80 exhibitors, and hundreds of fellow ARCC supporters as well as regional community and business leaders. There will be complimentary food samples as people network and socialize with their peers. “Door prizes and drink specials will round out your ARCC EXPOnential experience,” said Riley. The Adirondack Thunder hired Nathan Gosline to join their front office in advance of the 2017-18 season as the director of corporate sales. Gosline, a Queensbury native, has over a decade of sales and marketing experience in the sports industry. He joins the Thunder from the Tampa Bay Rays organization, where he served as director of sales for both Rays spring training and the Charlotte Stone Crabs of the Florida State League. Gosline worked within the Rays organization for two seasons and oversaw all sponsorship sales for both entities. Gosline served as the vice president of corporate partnerships with the Mississippi River Kings of the Central Hockey League from 2008-13. With the River Kings, he was responsible for managing the franchise’s corporate partnerships and expanding the team’s reach in the business community. Gosline also worked in the ECHL from 2002 -08 with the Florida Everblades, beginning as group sales manager before he was promoted to director of sales in 2005. Under his direction, the Everblades won the ticket sales department of the year at the 2006 ECHL League Meetings. He is a graduate of both Queensbury High School and SUNY Adirondack. Jeremy Ward, back, rear, manager of Cameron’s Deli in Queensbury poses with staff in the new store. The deli features to-go dishes available any time of day or night. 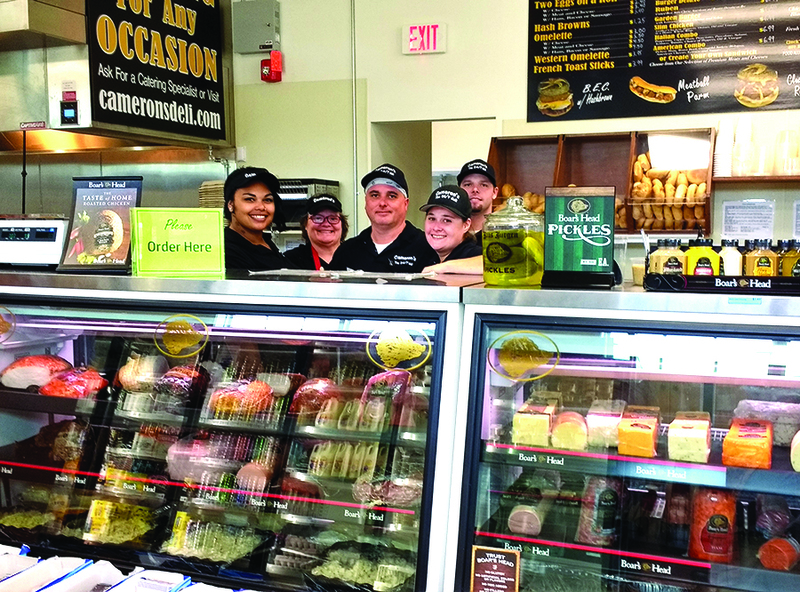 Cameron’s Deli opened its third location in Queensbury. Cameron’s Deli is a franchise. The business was founded in 1996, with the original location in Cross River, a town in Westchester County. The deli expanded to a second location in Brewster, N.Y. The restaurant in Queensbury opened at 446 Dix Ave. in June. Kurt Jaeger and Jay Salmon are co-owners of the restaurant. Jaeger is a founding member of Jaeger & Flynn, a financial services firm in the Glens Falls area. Salmon is an investment advisor. The two are friends and when they heard about the opportunity to own a business, they seized the chance. Cameron’s Deli is open around the clock, seven days a week. There is no indoor seating, although there are picnic tables outside for people who want to sit. The deli is intended to be a place for people to come, order food, and take it to go. “We never close our doors,” said Jaeger. There are many food items on the menu. The deli is especially well known for its chicken sandwiches. One that is popular is the Cluck’n Russian:, a chicken cutlet topped with melted Muenster cheese, several slices of bacon, and Russian dressing, all on a toasted hard roll. Massage therapist Dana Russell and her husband, Greg Russell, will open Adirondack Salt Cave LLC, Halotherapy and Wellness Center in the Union Square building at 11 Broad St. in Glens Falls. A popular holistic therapy is coming to Glens Falls. Over the last decade, more and more spas, massage therapy and wellness centers have added Himalayan salt caves to their treatment environments. 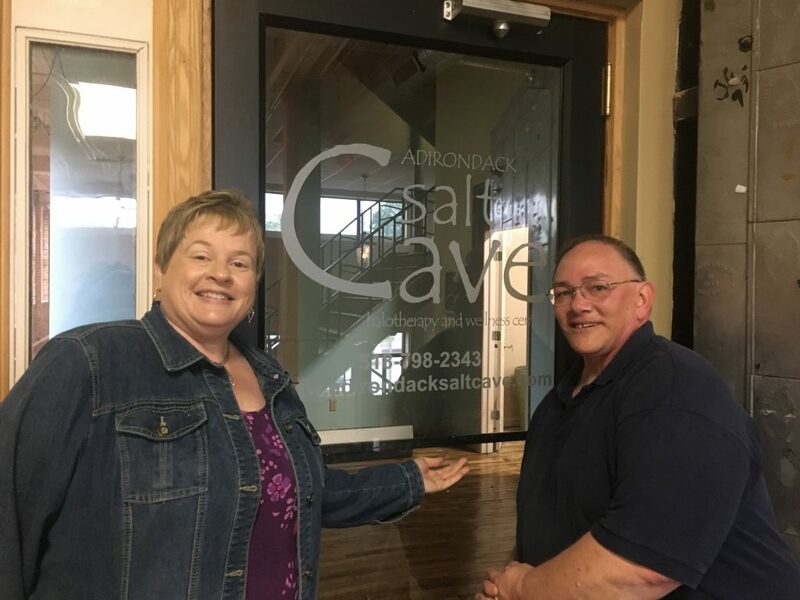 Massage therapist Dana Russell and her husband, Greg Russell, will open Adirondack Salt Cave LLC, Halotherapy and Wellness Center in the Union Square building at 11 Broad St. in Glens Falls. They said they expect to be busy right out of the gate. Halotherapy is the inhalation of micronized dry salt particles inside a chamber that mimics a natural salt cave environment. While this treatment is a relatively new phenomenon in the United States, it has been practiced for centuries by the indigenous people of the Himalayas. Europeans have also used halotherapy to treat respiratory ailments since the 1840s. Others have used it to improve symptoms of allergies and skin conditions such as eczema. Salt is said to be a natural antibacterial and anti-inflammatory, and contains nearly 90 different trace minerals. Inhalation of micro-particles released into the room—or cave—by way of a halogenerator. The benefits of this treatment are reputed to include improvement of respiratory problems such as allergies, COPD and asthma. 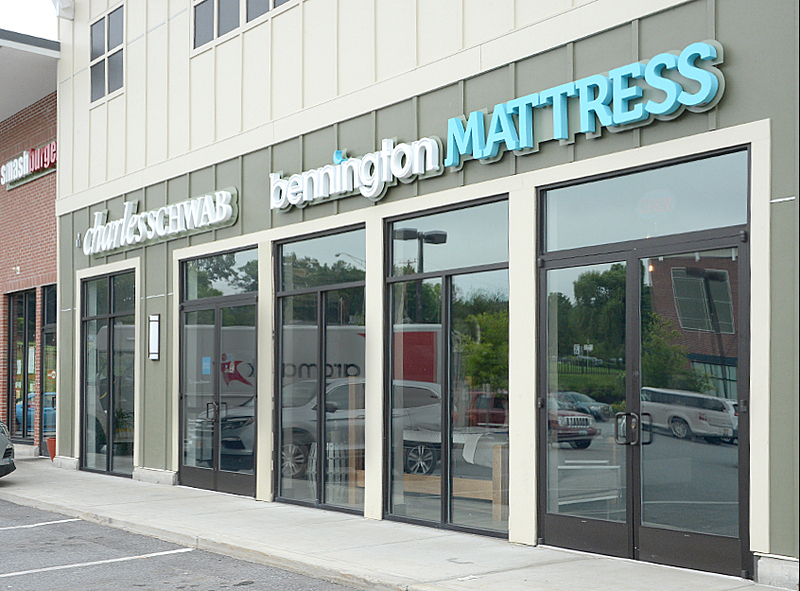 Bennington Furniture, which has outlets in six other cities, including Queensbury, has opened Bennington Mattress in the Fresh Market Plaza in Saratoga Springs. Bennington Furniture, Inc., which has a store in Queensbury, recently expanded, launching a new storefront in Saratoga Springs. The new space is located in the Fresh Market Plaza, situated between Smashburger and Charles Schwab, off Marian Avenue. Founded in Bennington, Vt., the 25-year-old company has grown rapidly—from two to eight stores—the closest being in Queensbury. There are four in Vermont—Rutland, West Dover, Manchester and Bennington—and one in Pittsfield, Mass. A full-service furniture, mattress, and interior design store, the company boasts “the best customer service in the industry,” highlighted by interior designer staff committed to helping customers find the most satisfactory deal. “The Saratoga market is more progressive,” said Daniel Sardina, advertising and marketing person with the company. “We love the community,” and feel the city can provide clientele for a personalized and cutting-edge service. He said most home improvement stores are rather vanilla by comparison.